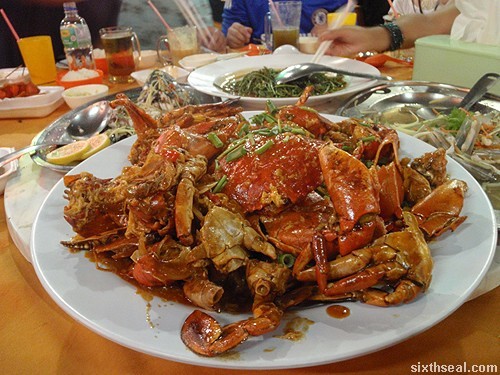 Permata Carpark in Kuching is host to some of the freshest catch from the seas if you’re not in the mood to drive down to Lundu or Serian. It’s smack dab in the middle of the city. My favorite is ABC Seafood (Stall #10) and we went to Bukit Mata Seafood Centre (Stall #25) this very day a week ago during the Project Alpha shoot. 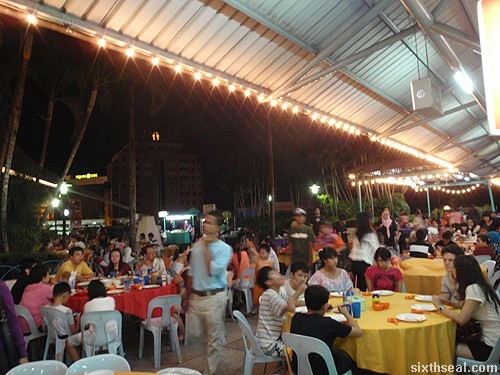 Verily, much has changed in Kuching but the popularity of this al fresco (a very atas word meaning open air) seafood court has not waned. 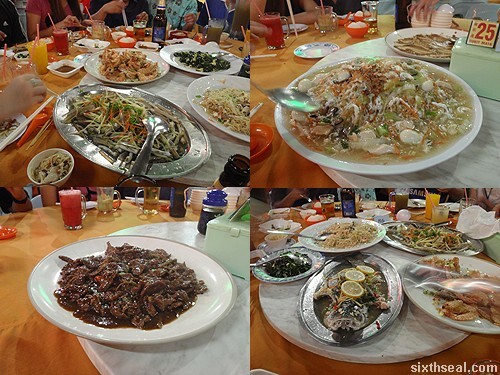 We had beef, prawns, ferns native to Sarawak, fish, noodles, bamboo clams and crabs. 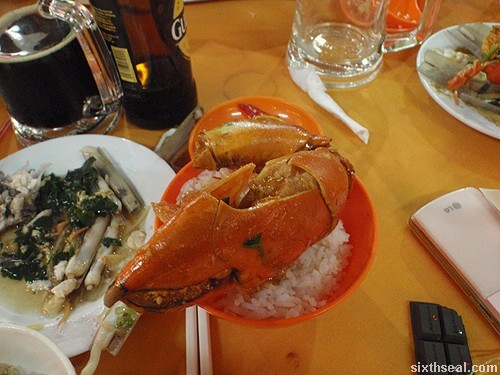 Me and Aud ate quite a bit of the chilli crab – it’s pretty big by normal crab standards if you don’t compare it to Alaskan King Crab. The sauce is tangy and sweet, with a hint of spiciness to it. It goes very well with rice, I just love the eggy and starchy texture of the gravy. 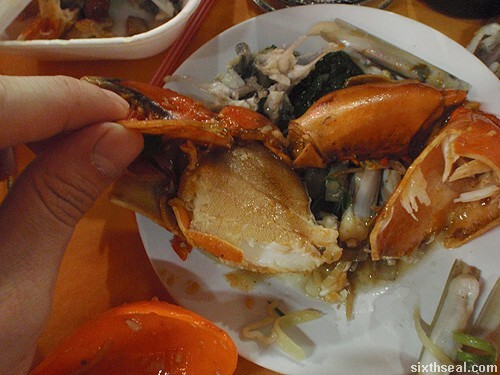 But the crabs really big lor.. I want I want I want !!! Huai Bin.. ur blog is so funny and so are u! HB, when you wrote there were fern in the dinner was fiddelhead fern the type grown wild in forest? The bamboo clams look good. Yo Eriku, Happy New Year to you mate! What’s with the fern? Why s everyone crazy about the fern, what’s so good about it? Must be a restaurant inside joke. When I was a kid, nobody wanted to eat this, then out of the blue, everyone is crazy about it. awwww… lacerations indeed.. didn’t they give you those irregular scissors to poke the meat out with..
Was the the source of the numerous visits to the toilet that were tweeted far and wide?? wow look at them claws! 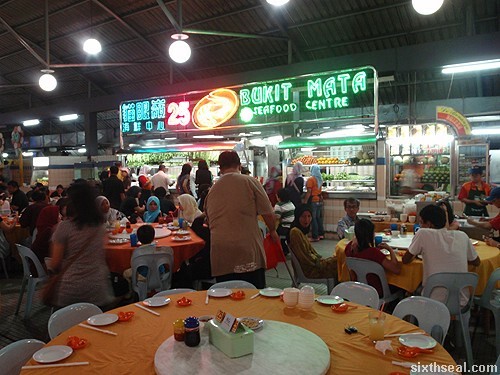 Yeah, I miss the Topspot seafood too! rocket: Haha! Well, I don’t know it’s probably the Ibans who introduced it to the Foochows who started cooking it. The story of the wild fern as told by my grandma (source: dubious). 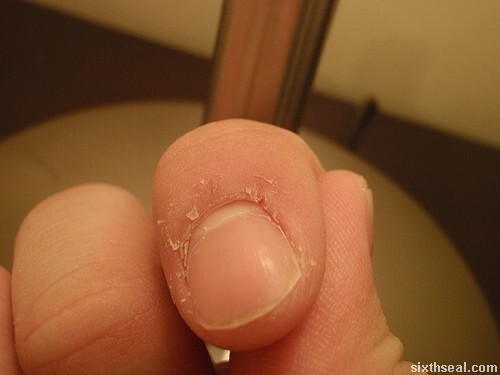 Dude, you finger nail is really clean, you remembered to clean under your nail. DYMM Tuanku: Yo, Sup ? Happy New Year to you too man !! was directed here by nomad gourmand’s other half. absolutely LOVE your writing style, and the antartica post. may i ask, what is the sixth seal? is it biblical? i’m intrigued. ooops, i suddenly remembered, i’ve met you before. duhhh! fatboybakes: Hello there! Yeah, sixth seal is from Revelation to St John (last book in the bible). It’s one of the judgements of God.